Howard Balsley is known in history books as a Moab uranium pioneer. McCourt’s account says that Balsley came to Moab in 1908 and primarily made his living as a forest ranger, but also prospected and assisted others in their mining endeavors, even before the WWII uranium boom. Balsley contracted with a number of small-scale miners across the Colorado Plateau to regularly make 50-ton shipments of uranium and vanadium ores to the Vitro Manufacturing Company of Pittsburgh, Pennsylvania. In the early 1930s, the company used the ores to make pigments for glass and pottery manufacturers. During WWII, Balsley used a similar business model to supply the government with vanadium needed for the war effort. After the war, Balsley went to Washington, D.C., and advocated for studies on the uranium potential in the Colorado Plateau, which “lit the fuse for the Uranium Boom of the 1950s,” according to McCourt. But Moab resident Lily Ann Balsley didn’t need a history book to know this history. She was Howard Balsley’s daughter-in-law, and in the decades since his passing, she has safeguarded an extensive collection of documents, pictures and artifacts that Balsley kept. “Howard didn’t even ever throw a little string away. He saved everything,” Lily Ann said. Lily Ann said she hopes to see Balsley’s collection preserved and made available to the public to help people today understand “just what it took” for Moab’s pioneers and early residents to build the town. She said she has been looking for the right person to write a book about Balsley’s life. 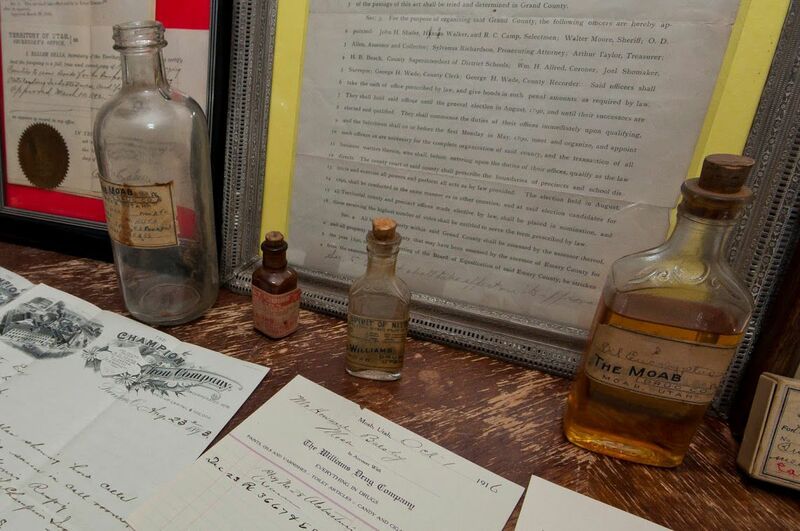 Much of the collection is 100 years old or more, such as a typed document signed in 1897 by J. Williams accepting employment as the county physician. John “Doc” Williams was Moab’s first doctor. Lily Ann said that when Grand County began to discard its old records, Balsley pulled them out of the trash and saved them. In addition to old county paperwork, there are many photographs of loved ones, landscapes and the people and places that Balsley encountered. There are innumerable handwritten letters and cards, and several well-preserved newspapers. Another receipt shows purchases made for the grubstake of Yellow Circle mine. Lily Ann said that a man (identified by McCourt as Charles Snell, and the year as 1915) told Balsley that he had dreamed of a place where a good uranium mine could be found, and that the dream told him a rock with a yellow circle would mark the spot. Balsley agreed to sponsor it, and Snell returned with a rock matching the description and news that the search had been successful. At the time, the market for uranium was limited, though when the uranium boom came it would become “a million-dollar producer,” according to McCourt — though that was after Balsley had sold his interest in the mine. According to McCourt’s book, it was donated to the Dan O’Laurie Museum, later know as the Museum of Moab (recently re-branded as the Moab Museum). During the Great Depression, Balsley was in charge of handing out welfare distributions. He would submit receipts from the purchases of goods at area suppliers and the federal government would provide a reimbursement. One receipt, dated from 1933, is made to Jack Beeson for the purchase of salt, pepper, flour, coffee, lard, potatoes and other household staples. Coincidentally, Jack Beeson’s grandson, Mark Beeson, has been instrumental in organizing and preserving Balsley’s collection, Lily Ann said. (Beeson is also who told the Moab Sun News of Howard Balsley’s role in Depression-era welfare distributions). She said Beeson has fulfilled a longstanding wish of hers to see the collection carefully cataloged. Beeson has organized much of the collection with page protectors in a series of labeled binders: Moab Roads, Moab Government, Cows/Gold, Water Rights and Schools are some of the titles. Other parts of the collection are organized in filing cabinets, while others are framed. “It’s like a story told all in receipts,” and other documents, Beeson said, noting that the history contained is not just Balsley’s, but that of Moab in its earlier years. Beeson said the collection reflects Balsley’s generosity and his connections to other people in the area. Lily Ann agreed that Balsley was exceptionally giving, and never got out of the habit of being frugal, even as he acquired financial success and owned a number of mining claims and properties in the area. She said he also financed kids in college and gave generously to his church. The Moab Museum is currently closed for renovations, but museum director Forrest Rodgers said in an interview with the Moab Sun News that Balsley will be featured in a new exhibit when the museum reopens later this year.